I love seeing maxi skirts/dresses incorporated into transitional season outfits - something I'm definitely wanting to do more of this Autumn! 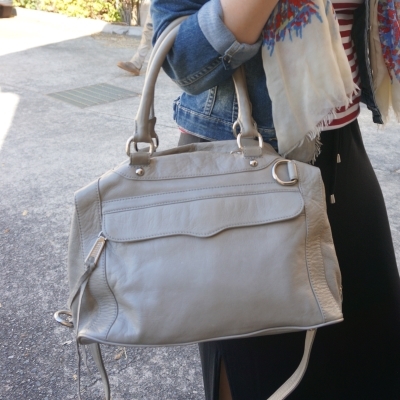 Gorgeous mustard-coloured bag, by the way. I totally agree that you can't go wrong with stripes! On my last closet audit I realized just how many striped tops I have and had to put myself on a ban from getting any more but I do actually wear all of them You have the best collection of RM bags Mica! Two great looks Mica ! The pattern mix on the first is lovely and the color combination on the second makes me smile. Even though its not the "original" cardi you wanted, it looks great. 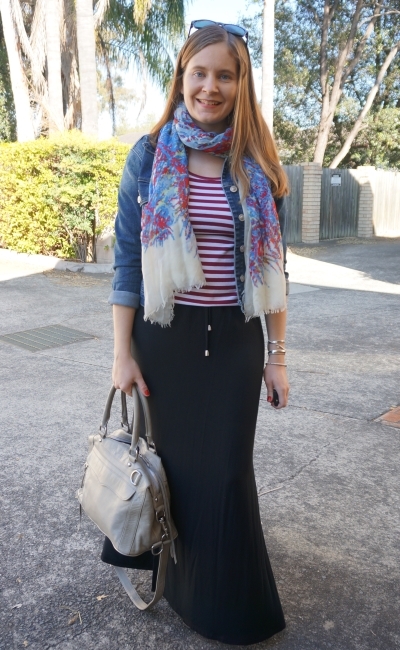 I like the first look - the mixed prints look awesome, and I like that you've done a maxi skirt. The second outfit...not sure if that striped top is doing you any favours. However! That mustard cardi is FAB on you, Mica! I love it! Totally agree with the stripe rule...I have been having some fun playing with them too. Hi! Beautiful looks! 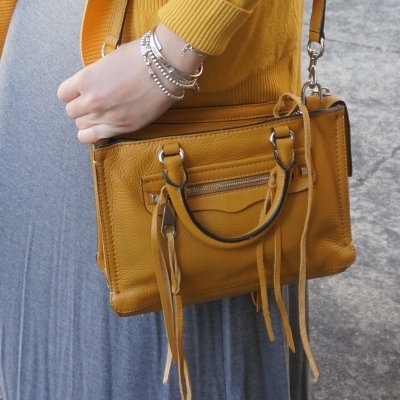 The mustard cardi and bag is so cute and pair well with the stripes. Thanks as always for the inspiration! Pray you are having a great week! I totally agree that you can't go wrong with stripes. Or maxi skirts, as you show perfectly! These are such cute, comfy looks--the second one is my fave. I love the yellow!! Love these outfits, I might need a Rebecca Minkoff bag! Jersey skirts are timeless! I love these looks! I am also a huge fan of stripes, 90% of my tees are striped, haha. 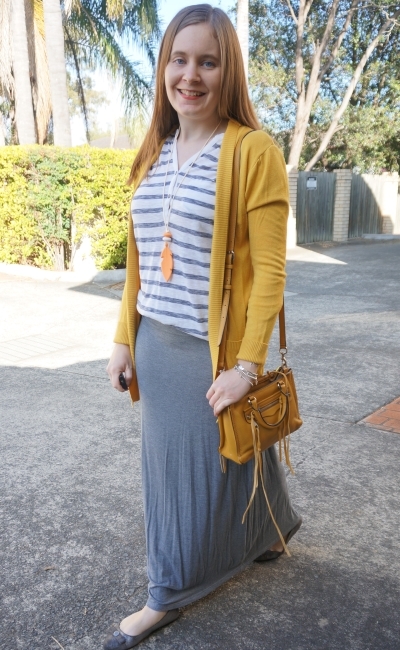 I am loving the grey and mustard combo! As much as I love stripes, to be honest, I don't have many in my wardrobe anymore. I probably have a good handful of stripes. I love bot of your outfits here, the first one definitely is a favourite. That MJ scarf is a gorgeous print. <3 Enjoy the week Mica. I'm sure I have too many stripes, ha! It's a frequently occurring print in my wardrobe! I love both look! The maxi skirt is perfect! LOVING stripes on you Mica! I have a couple in my closet that I pair with shorts & skirts. Always love red white & blue! Loving that yellow & grey together. You look so cute! I thought of you while I was traveling this past week because everyone was wearing maxi dresses and skirts!